African environment. A German will ask: "why in the middle of winter ? ", well, the answer is simple. There will be long legs, passing the North African desert, and at present the temperature is rather low there. The eagle has landed ... Finally, after another 355nm N81EU has reached her destination. Thomas landed at Yaounde / FKYS at 13:38 UTC. After 45h airtime plane and pilot are in good condition. and after crossing Nigeria, the new home for the next 2,5 years is now Cameroon. The list of continents also has increased, beside America, Asia and Europe, Africa is now on the records. For me it's time again to say "Good Bye" and return this page to the pilot for more data and pictures to come. Thanks for being with me throughout all the Orbits and the last 11 days. After crossing Nigeria, N81EU has finally reached Cameroon. Touch down was 16:29 UTC at Garoua. The plane performed perfect. One more leg of about 4:30 hours remains for tomorrow to reach Jaunde. another trial to leave in the afternoon just gave proof, that the previous conditions are still prevailing. Later today an additional oil cooler, which happens to be onboard, will be integrated into the system. preferably tomorrow early morning, as the present weather is a little bit reluctant to change to our favour. and even more at several hundred feet above ground. today are more or less gone by now. So are the chances to meet his desk at the office tomorrow morning. All the paperwork is done, but today's takeoff, planned at 07:00 UTC was disabled by low visibility and a lot of sand in the air. According to airport officials at Zinder, a rather rare WX condition, but this doesn't help N81EU at all. Let's wait for improvement. It might cause an extreme long flight for tomorrow, trying to reach Jaunde in an one day trip. tomorrow morning. There will at least two more days, until N81EU will reach her new home. tomorrows flight, enabling the jump over Nigeria straight to the city of Garoua /FKKR in Cameroon. since 09:20 UTC this morning, N81EU is on her way from Agades / DRZA to Zinder / DRZR, both in Niger. It took three hours yesterday night before the final confirmation, regarding the safe touch down, reached old Germany. According to the Pilot, the flight was fun, although he had to choose high altitude to keep the engine cool. So no real chance to have a "close inspection" of the dunes in the desert. 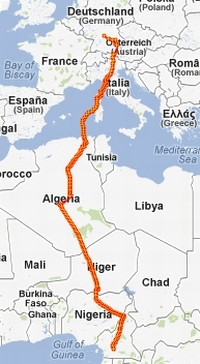 old track at Tamanrasset / DAAT and continued straight without any stop-over into Niger, the neighbour of Algeria. to have been running smooth and perfect,. Let's wait for the pilot's comments. The duty started with taking off from DAUG at 09:55 UTC this morning. It turned out to become a short flight today. the satellite tracking was interrupted about an hour before arrival and triggered some excitement on the ground. Taking off at 09:40 UTC this morning from Ajaccio / LFKJ, the plane headed South towards the continent of Africa. while climbing as requested, the engine suffered from carb icing in the clouds but came safely back to life at a lower altitude. It also looks as if the small computer, running FlightMap for navigation, doesn't like big altitudes. At about 13:43 UTC Thomas reached the coastline of Northern Africa. after a long flight with no fun. N81EU has landed at 14:50 UTC at LFKJ. Pilot and plane are fine. Today four countries on the list, Germany, Austria, Italia and France. Sea channel between Italy and Corsica again some high, snow covered mountains on the island. on the way to the Alps. Inbetween Thomas is close to todays harbour Ajaccio / LFKJ on the beautiful island of Corsica. change tomorrows flight path down to Korsika. "down" to Jaunde, the capital of Cameroon.